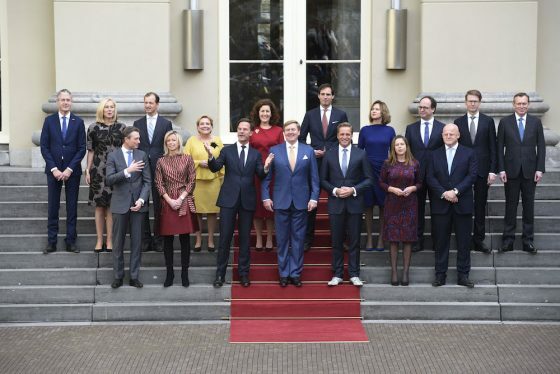 The new Dutch cabinet was sworn in by king Willem-Alexander on Thursday morning, before taking part in the traditional photograph on the steps of the king’s offices in the Noordeinde palace in The Hague. Seven months after the general election, the new line-up of 16 ministers and eight junior ministers is now ready to start work. ‘We are going to keep a close eye on the money,’ Rutte said on Wednesday, after holding individual talks with all the members of his third administration. Although a largely new team, one member – Menno Snel who will take charge of the tax office – has no political experience and, according to the Volkskrant, was not even a member of D66 before his appointment. All but two of the eight junior ministers are sitting MPs, as are most of the other ministers. Just three faces from the previous cabinet – Mark Rutte, Eric Wiebes and Sander Dekker – are returning to front-line jobs. None of the 24 ministers has a non-European background and just one, Croatian-born Barbara Visser, originates from outside the Netherlands. Home affairs minister Kajsa Ollongren is the only dual national, with Dutch and Swedish passports and is also the first openly gay politician to be appointed deputy prime minister. The cabinet also has a narrower age span than its predecessor, with 40-year-old Schouten the youngest member while Ferdinand Grapperhaus (CDA justice minister) is the most senior at 57. The four parties making up the new coalition have a majority of just one seat in the lower house of parliament, so the knives from the nine opposition parties will be out from the word go. PVV leader Geert Wilders, with 20 MPs the second biggest party, has already attacked several of the new ministers for what he calls their links to terrorism. Of the new entrants to the lower house of parliament this March, Thierry Baudet of the Forum voor Democratie, has shown himself to be a master of theatrics while on the other side of the political spectrum, GroenLinks leader Jesse Klaver, who pulled out of the coalition talks despite coming fifth in the election with 14 seats, will be keeping a close eye on the cabinet’s ambitious plans to combat climate change. Labour (PvdA) leader Lodewijk Asscher, social affairs minister in the previous administration, has also been quick to make a noise, calling on the new government to abandon its plans to cut spending on district nursing. Prime minister: Mark Rutte (VVD). Worked in industry before joining parliament. PM since 2010. Still teaches at a trade school one day a week. Social affairs and employment: Wouter Koolmees (D66). Civil servant and an MP since 2010. Key role in the coalition talks. Economic affairs and climate: Eric Wiebes (VVD). Struggled with reorganizing the tax office in Rutte’s second government. Agriculture, deputy PM: Carola Schouten (CU). A parliamentary party worker to 2011 when she became an MP. Justice and security: Ferdinand Grapperhaus (CDA). Professor of European labour law in Maastricht, member of the SER advisory body. Justice and security: Sander Dekker (VVD). Junior education minister since 2013. Alderman (education and finance) in Rotterdam. Defence: Ank Bijleveld (CDA). An MP in 1989, Bijleveld has been king’s commissioner in Overijssel since 2011. Schools and media: Arie Slob (CU). A teacher by profession, Slob was elected to parliament in 2001. Care of the elderly, deputy PM: Hugo de Jonge (CDA). Alderman in Rotterdam (education, youth, care) since 2010. Health, welfare and sport: Bruno Bruins (VVD). Currently chair of state jobs agency UWV. Home and kingdom affairs, deputy PM: Kajsa Ollongren (D66). Was Mark Rutte’s secretary general until 2014, then Amsterdam alderman. Foreign affairs: Halbe Zijlstra (VVD). An MP since 2006. Known as a hardliner, he has called for a ‘realistic foreign policy’. Foreign trade and development: Sigrid Kaag (D66). UN representative in Lebanon since 2014.